This classic and charming Mexico City villa is located in the exclusive, private guarded and gated community of Club de Golf Mexico. Secure and very private, one of the area’s premier golf courses is just steps from our door. Near the site of the 1968 Summer Olympics, the location is convenient to shopping, restaurants, airport and schools. The home shows true “pride of ownership” having been updated maintained to the highest level over the past 2 decades of single family stewardship with live-in service staff. The home has off-street parking and a garage. Featuring custom designed furniture and lighting fixtures, the paint themes are fresh, colorful and inspirational having been the home-base of an internationally acclaimed screenwriter for many years. The first floor working studio overlooking the courtyard features pull-out sofa and work out area, and the massive courtyard offers a hot tub to relax or reflect under the sun or stars. Just walking through the front door you’ll feel “at home” with classic stone, tiles and massive woodwork. The first floor also offers an eat-in kitchen, formal dining room and beautiful living room with fireplace and custom built-in shelving and storage. A solarium with large glass roof brings abundant light into the orchid garden and fountain. The second floor offers a large master bedroom suite with balcony, skylight in the custom tiled bathroom, black-out shade, and massive custom walk in closet. Storage abounds. There is an additional very large bedroom suite with bathroom, private sitting area and laundry, and a third bedroom with separate bath. Each sleeping space is bright, unique and very comfortable. 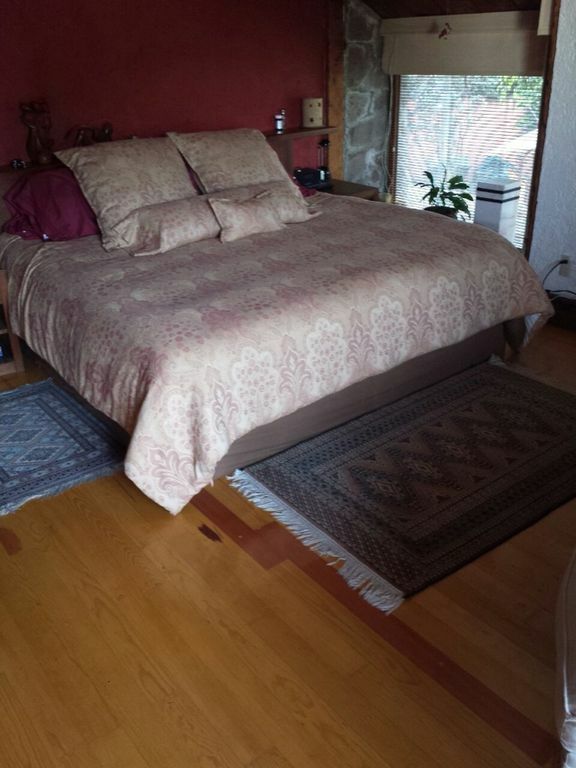 The third floor has a fully functioning studio apartment used by the live-in service staff. It has a separate entrance off the first floor kitchen up a wrought iron spiral staircase. One look at this open and cheerful home and you’ll never want to leave.